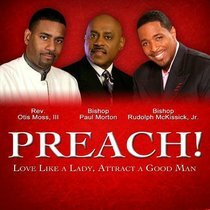 New from EMI Gospel, the Preach! series features a mixture of sermon and song, from revered pastors and preachers and well-known Gospel musicians. Love Like A Lady, Attract A Good Man features three eye-opening sermons on relationship issues for women interspersed with music by Sheri Jones Moffett, Donald Lawrence and the Tri-City Singers, and Myron Butler. About "Preach! Love Like a Lady, Attract a Good Man"